We acknowledge and honour the contribution of Judith Durham AO and Kutcha Edwards in their pioneering work of 2006 ‘Lyric for contemporary Australia’. This commenced the movement in Australia for a new National Anthem. Here are some notes on the main themes embraced in our proposed song, 'Beneath the Southern Cross'. They can be used as a teaching aid in schools and for public reference. Core Australian values are embodied throughout the new lyrics. The values of our Freedom, achieved by the rule of law; Diversity; Mateship; a Fair Go; and Respect for our First Peoples are at the heart of the new piece. Historical links to the old and familiar song are strongly referenced through the music and the refrain. Included in the new lyrics is the well-known refrain from the present National Anthem - Advance Australia Fair, which appears in all verses. One of the most beautiful lines written by Peter Dodds McCormick 'Of beauty rich and rare' is also included in Verse 1. Verse 1 is designed to be sung as a stand-alone verse should the practical time constraints of a public event or occasion warrant that. This is currently the position with the present National Anthem, where commonly, including at Government House functions and AFL/NRL grand finals, only Verse 1 of the present National Anthem is sung. All three verses may be sung where time permits (eg. at school assemblies and gatherings or at citizenship ceremonies). Verse 1 opens with a triumphant fanfare which calls upon all Australians to celebrate the inclusiveness and the vibrant spirit of our great country. The lyric aims to launch these central themes of the anthem from its beginning. It draws upon the familiar opening four words of the present National Anthem to focus on ‘The spirit of our land’. These lines speak of the extent and breadth of our home, the continent of Australia and adjacent islands. Shores of Mer (Murray Island), Torres Strait Islands, the birthplace of Eddie 'Koiko' Mabo. This is an important line: "One people of this ancient home." It talks of our unity in diversity and the success of our multicultural society. It also references the extensive period of Indigenous occupation of the continent and adjacent islands from ancient times. Multi Cultural Choir – Harmony Day, Melbourne. This line, 'Of beauty rich and rare', tells of the rich and rare beauty of our land. Many would argue that this was one of the most beautiful lines of the original patriotic song penned by Peter Dodds McCormick in 1878. This is now out of copyright as he died in 1916 and the copyright expired 50 years later in 1966. These words describe our country sharing with us all the basics of life. The line makes reference to the Aboriginal concept of mother Country 'giving' to support life and her people, a concept which is uniquely and strongly Australian. This leads into Line 8. Line 8 references a core value of Australians – our freedom. The life provided by Country enables us to enjoy this basic freedom. Supported by the rule of law and the institutions of our Parliaments and our Courts, it is the envy of so many parts of the world, where it is sorely absent. Here we acknowledge and celebrate this important value. These lines provide a rousing conclusion to Verse 1. They reference the five star Southern Cross star formation, and capture the title to the piece ‘Beneath the Southern Cross’. We all live under the Southern Cross, as did our First Australians for many thousands of years. The formation can be seen all year round from almost anywhere in the Country. The five stars of the Southern Cross are represented on the Australian flag, and it is referred to in the opening line of the second verse of the present Anthem: “Beneath our radiant Southern Cross”. The Southern Cross also played a prominent part in Aboriginal and Torres Strait Islander astronomy. Indeed, it has been recently announced (Jan. 2018) that the International Astronomical Union has given the fifth-brightest and smallest visible star of the Cross the name “Ginan”, the name it has been called for generations by the Wardaman people of the Northern Territory in the Katherine region. For this people, Ginan represented a red dilly-bag filled with special songs of knowledge. There are numbers of other dreamtime Indigenous stories about the Southern Cross which have survived to this day from different parts of Australia. The lyrics reinforce the theme of us finding 'unity in diversity'. The refrain concludes with the traditional and familiar 'Advance Australia Fair'. ‘Fair’ refers to the importance of treating all people equally and without discrimination – in other words, giving everybody a ‘fair go’. This works with the music in a way which provides a dignified and familiar anchoring refrain to draw all of the verses together. Here, the extensive occupation of our First Peoples is honoured. According to contemporary science, this occupation has been for 60,000 years or more. These lines provide the principal recognition and inclusion element of the new lyrics. They say something of the breadth and extent of occupation by the First Nations of the Australian continent and adjacent islands. The focus on Indigenous culture is referenced by the twin themes – the role of mother Country as the provider of all things, and the spiritual role of the sacred Dreamtime for our First Australians in explaining the world through the rich tradition of the stories passed down through the generations. The reference to the Dreamtime being told ‘By word and artist’s hand’ calls upon Australians to engage in a learning process about the ancient Indigenous culture as part of the journey towards reconciliation. The Dreamtime is central to the culture of our First Peoples. It’s great stories of creation represent the Aboriginal understanding of the world. It is the beginning of knowledge, from which came the laws of existence which must be observed for survival. The ancient stories of the Dreamtime were passed down by word of mouth for thousands of years. They were also represented in dance and song and in Australian Indigenous art, including rock art which survives to this day - representing the oldest unbroken tradition of art in the world. The Indigenous culture of the Dreamtime is honoured in these lines. See: 'Uluru Statement from the Heart', May 2017, and the Final Report of the Referendum Council dated 17 June 2017, which notes '60,000 years or more' as the period when Indigenous occupation of Australia first began. Further, the 60,000 years plus period (BP 60,000+) has also recently been confirmed by a team of archaeologists and dating specialists led by Associate Professor Chris Clarkson from The University of Queensland School of Social Science, as detailed in the Nature journal published 20 July 2017. This discovery arises from the analysis of evidence derived from the Madjedbebe rock shelter, Kakadu. 306 Nature Vol 547, 20 July 2017. The verse then moves to those who have immigrated to Australia and speaks of Australians becoming a nation which respects its ancient history and works together to achieve prosperity. These lines represent a prayer for inclusion of all members of our multi-cultural society and the movement towards a declaration of peace and reconciliation with our First Peoples. ‘Respect for all grows there’ speaks of the need to conduct our relationships with dignity and mutual respect. It echoes the example set by 'Country' in the first verse - sharing her gifts of life without discrimination. "He went into the world. He did. He wasn't fighting for himself. He wasn't talking for himself. He was talking for all Australians to unite and walk together." Dr. Yunupingu is honoured in our lines. The second verse concludes with “From every place on Earth we sing” as an introduction to the refrain “Advance Australia Fair”. This line celebrates and emphasizes our successful multicultural Australian society of the 21st century. The first stanza acknowledges that times can be tough in Australia. Through natural disaster many lose everything in devastating circumstances. This is when Australians support each other and the core value of 'mateship' comes to the fore, representing the Australian embodiment of the cultural norms of equality, loyalty, friendship and mutual support when it is needed. Although there can be a variety of meanings attributed to ‘mateship’ (See: Nick Dyrenfurth, ‘Mateship – A Very Australian History’), this is the ‘true blue’ sense captured in these lyrics. ‘Mateship’ in Australia had its origin in the convict days, and in the ‘fabled decade of the 1890’s’. The value became entrenched as a core value of the Nation by the courage and fortitude of the ANZACs at Gallipoli and in conflicts beyond. It is now recognised as central to our national identity and something uniquely Australian, and “for better or for worse”…. “part of our cultural DNA” (Nick Dyrenfurth, ‘Mateship – A Very Australian History’). The former Prime Minister John Howard OM, AC described ‘Mateship’ as having assumed “a hallowed place in the Australian lexicon” (Radio National, Lingua Franca, 24 April 1999). The stanza ends on a positive note, with the assurance that, with sustained hard work and a helping hand from us all as mates, we pull through - 'And wattle blooms again'. 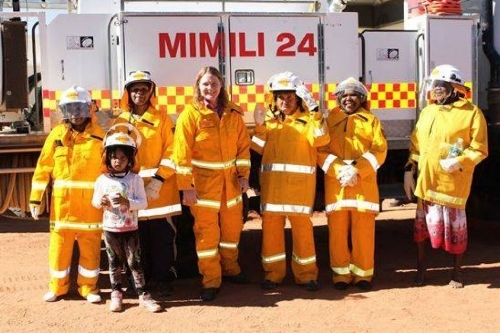 The Mimili CFS brigade women are South Australia's first female Indigenous volunteer firefighting team. They capture the modern spirit of ‘mateship’ applying to everybody. There are layers of meaning and symbolism expressed in the few words of this line “And wattle blooms again”. The lyrics reference our natural bush - symbolized by the green and gold of the widespread Australian wattle. The golden wattle grows across Australia and is a symbol of unity. The lyrics express the spirit of the Australian people. In times of disaster, by combining together to help each other as ‘mates’, we are able to restore the bush and ourselves. The natural resilience of wattle represents the fortitude of the Australian people when things get tough. The Indigenous peoples of Australia from time immemorial made good use of the wattle. They soaked the gum of the golden wattle in water and honey to produce a sweet, toffee-like substance. The tannin from the bark was used for its antiseptic properties. Finally, the green and gold are celebrated in our National sporting colours. They are worn with pride by our athletes on the sporting field, on the track, on the court, and in the swimming pool. Australian Government, Department of Prime Minister and Cabinet website https://www.pmc.gov.au/government/australian-national-symbols/australian-floral-emblem (last observed 14 April 2018). The second stanza looks to the future. It concludes with a reference to our aspiration that we will continue to be a free country and offer a 'fair go' to our citizens. The reference to 'beneath her stars' takes in the Southern Cross star formation, an iconic Australian symbol reproduced on our flag. It is something that every Australian can experience on a clear night in the southern sky, as it was from time immemorial by our First People. The final refrain returns to the first refrain in a rousing concluding lyric. The words of the patriotic song ‘Advance Australia Fair’ have never been set in stone. The song has developed from the colonial era when it was first written in 1878, through to federation in 1901 when a replacement third verse was included to refer to the new Commonwealth, to about 1907 when new lines were added to the last verse to emphasize connection with Britain, to when it was substantially re-modelled in 1984 by producing a cut down version of the song (from four verses to two) and making it gender neutral in preparation for its adoption as the National Anthem. At each stage, the words of the song have been changed in an attempt to reflect changes in the political and social fabric of the country. However, at each stage to date, our First Australians have not been acknowledged in the Anthem. We are also moving forward on a journey towards reconciliation when a 'declaration of peace' is called for. See Deborah Cheetham's opera 'Eumeralla - a War Requiem for Peace'. Perpetuation of hurt by exclusion has no place in our national hymn. In this context, it would surely serve us well as Australians to speak though our National Anthem of who we are, what we stand for in our core values, and everything we celebrate in this great country of ours. The re-vitalised Australian National Anthem proposed by RAP for the 21st century and beyond is offered for consideration as a means to achieve these ends – something in which we can truly ‘Rejoice’.